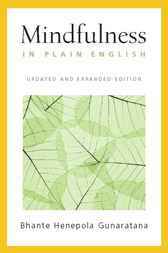 With over a quarter of a million copies sold, Mindfulness in Plain English is one of the most influential books in the burgeoning field of mindfulness and a timeless classic introduction to meditation. This is a book that people read, love, and give to everyone they knowa book that people talk about, write about, reflect on, and return to over and over again. Bhante Gunaratana was ordained at the age of 12 as a Buddhist monk in Sri Lanka, earned his Ph.D. in philosophy from The American University, and has led meditation retreats, taught Buddhism, and lectured widely throughout the United States, Canada, Europe, and Australia. He lives in High View, West Virginia. Bhante Henepola Gunaratana is the president of the Bhavana Society in West Virginia.